Outfits with tan boots. Believe me when I tell you that there’s another color you can pair up with everything and anything at all: tan. We all have that one favorite tan article in our wardrobe that makes up our go-to outfit. But let’s also admit that trends keep changing and so does our wardrobe. One thing you do (If not, you should!) have in your wardrobe is a nice pair of tan leather or suede boots. With limitless ways of pairing the color tan with a pallet of colors, tan boots are the perfect item to jazz up your outfit. Where tan boots can soften your every day or formal look, they can be a perfect alternative to otherwise bold black boots when paired well. 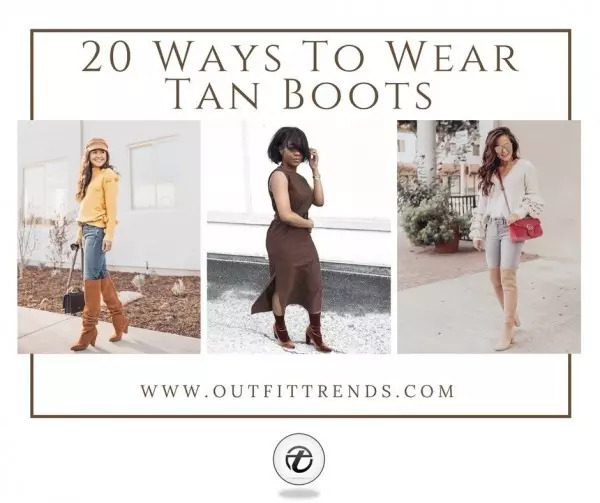 We have picked these 20 perfect outfit ideas for you to tie up your ensemble with tan boots. Check them out. Give your casual look a classic twist. Match up your favorite t-shirt or a sweater with a pair of dark washed jeans and over-the-knee tan boots. You can also switch OVT boots for boots and rock the look. Add up a couple of gold bangles to tie your outfit together. Have a look at these 60 Cute Outfits to Wear with Boots for Girls. Create the perfect cosy fall look. Pair up your soft tan ankle or Chelsea boots with a light shaded sweater and your favourite pair of jeans. It not only adds an extra oomph, but also brings the outfit together. Sport a pair of gold hoops to complete the look. Now tan boots aren’t limited to only ankle or Chelsea boot styles. Add extra volume to your ensemble by wearing a pair of dark tan leather wedged boots with a turtleneck or a trench coat. Keep the rest of your outfit toned down to make your boots stand out. The idea of wearing boots with a dress drifts off to more on the cowgirl-ish side. But it’s absolutely wrong. Make a pair of tan long boots stand out by wearing them with your pastel dress. This look is perfect for a fall brunch or a mid-winters lunch out with your girls. Good thing about boots is that you can air them up with almost anything and everything and still pull the outfit off perfectly. Jazz up your ensemble with a pair of your favourite tan boots and elevate your work style. Natasha illustrates perfectly how you can match up those tan velvet booties with a long, short-slit dress. Don’t be afraid of experimenting with your style and adding up a narrow belt around your waist and a couple of gold bangles to tie the look together. Here are 20 Best Outfits to wear on a Date. Be it tan Chelsea, combat or ankle boots, all of them go perfectly well when worn with a drape around your shoulders. A perfect afternoon lunch date outfit can be achieved by sporting this chic yet comfy drape wrapped around and tied at the waist with a belt. Overalls are the ultimate go-to articles. Elevate your work style by pairing a pair of tan heel boots with a monochrome overall. Add a pair of silver hoops and a don’t-care hairstyle to complete the look. Want to add a twist to your cool outfit? Match up a brightly colored red, rust or sunshine yellow dress with a pair of knee-high tan boots. An ooh-la-la and a proper chic outfit for your brunch with girls right there. WIth limitless styles and versatility of tan boots, peep-toes are a definition of a proper stylish item. Ditch your bolder black shoes for a pair of tan peep-toe booties to match with your little black dress. Add a gold bracelet to jazz up your look. Get that edgy yet sophisticated look by pairing your favorite pair of heeled, patterned tan boots with your casual work attire. Guaranteed to turn heads. Check out these Celebrity Work Outfits for Women. Need an outfit for your daytime date? Match up your knee-high block-heeled tan boots with an ivory sweater. Jazz up your attire with a soft up-do and pearl studs. An all white outfit plus a pair of tan boots is an outfit matched in heavens. The look goes best with waist-high pants and a plain white crop-top. Take your clubbing style to another level by adding a fur puffer and killer heeled tan boots. Wearing boots with skirts can get a little tricky. Pair up your tan ankle boots with pale colored below-the-knee skirts to create that soft, romantic outfit for your date. Throw a coat over your shoulders if the weather gets chilly. Plan to go for a cute, chic outfit for your day? Dresses with boots give you your dream ensemble. Match up your dress with a short hem with Over-the-knee boots but pair short-heeled tan boots with dresses with a longer hem. There is absolutely nobody who wouldn’t like an all-black-everything outfit. Achieve the perfectly swoon-worthy outfit by adding a pair of patterned tan Chelsea boots. Guaranteed to make heads turn. Have a look at these 25 Celebrities All Black outfits Styles for Fall to Copy. Tan boots are your best friend when you need to pull off an outfit for a casual stroll around the town or a lazy work day. Throw a light woolen cardigan to your t-shirt and jeans combo and pair up your tan ankle booties to take your work style up a notch. Channel your inner edgy self by pairing a pair of cargo pants with tan boots and fur coat or jacket. Add a pair of hoops to your swoon-worthy outfit to add an extra edge. Wearing knee-high boots with a short skirt can be a perfectly smecksy outfit for a night out in clubs with your girls. Sport a denim skirt with a plain black or printed shirt and a denim jacket. Add up a pair of slim, tan long boots and elevate your look by adding beach waves to your hair. Make heads turn by sporting a sunshine yellow turtleneck with your favourite tan slouch knee-high boots over a pair of dark washed jeans. Add extra oomph to your outfit and wear a pair of large hoops and a simple cold chain.